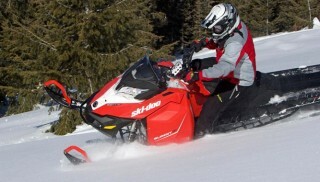 We spent five days riding the 850 Ski-Doo Summit X in both 154 and 165 track lengths. Of those days, one was in rugged British Columbia with Ski-Doo Summit Ambassador Carl Kuster; this is where we first met the monster Summit X 850. The other four days were consecutive ones in the steep-n-deep backcountry north of West Yellowstone, Mond. where the cliffs and crags border the Northern tip of Montana’s Hebgen Lake. We know the 850 Summit X; we rode it hard and left the mountains out of breath. 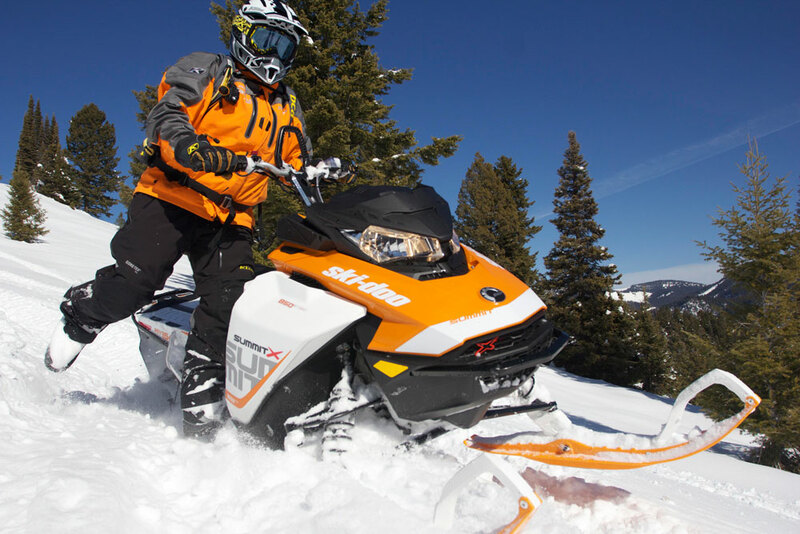 For model year 2016 (this past season), we learned the number one selling snowmobile in North America was the 2016 Polaris AXYS Pro-RMK 155. 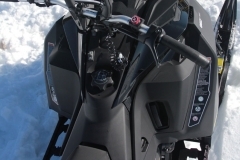 For numerous years now, the number one selling snowmobile in North America has been a mountain snowmobile, with the last few years’ bragging rights occurring between Ski-Doo and Polaris. 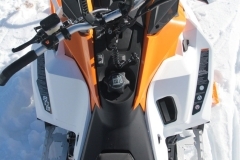 Way back when, when Arctic Cat built its M8 Sno Pro and Limited with the Diamond direct drive, this began the trend for a mountain snowmobile to be the most often purchased snowmobile. And remember, this comes from a market where overall snowmobile sales figures are between 25% and 28%. 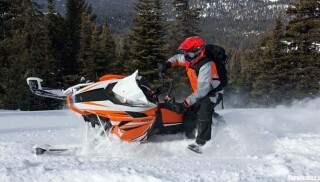 Westerners are always hungry for the latest whiz mountain snowmobile – and the manufacturers know this. 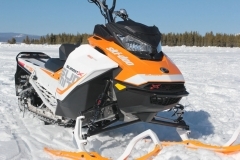 Ski-Doo wants to be competitive, but this time the Valcourt, Quebec, Canada company set out to first compete against itself. Ski-Doo had long tribal talks with its mountain-specific dealers, who in turn polled its customers; a process called feedback and improvement. With its bold new aggressive stance that is lifted and tightened, like a movie star receiving a makeover, the Gen-4 REV Summit X is high and tight for the steep-n-deep. With all this data, Ski-Doo set on a course to fully reinvent its Summit. Not to improve the existing XM chassis (which was an improvement to the XP Summit X with S-36 handling package), but to design, engineer and build from the ground up, an all-new Summit, which included a new narrow motor, narrow chassis, lighter track and lighter front suspension. This new Gen-4 Summit stays with Ski-Doo’s pyramidal design, though, which gives the Summit X 850 its rigidity. This Gen-4 project began about four years ago and gained momentum as time clicked on. Part of the “future” 2017 Summit X 850 was retention of a Rotax E-TEC motor, but an all-new 850R E-TEC with additional boost fuel injection. The front suspension is the Rapid Action System (RAS), not RAS-2, but a die-cast aluminum RAS-3. The rear suspension is tMotion, the only component carried over from 2016. The track is a PowderMax FlexEdge track but a lighter 2.5-inch or three-inch paddle track from last year known as PowderMax Light. Track/chassis lengths for the 850 Summit X is 154 and 165, gone is the 163. The RAS-3 front suspension with coil-over KYB shocks provide excellent bump-soak capabilities, but the RAS-3 front mostly resists handlebar slap, and contributes to the Summit’s airy feel through the handlebars. 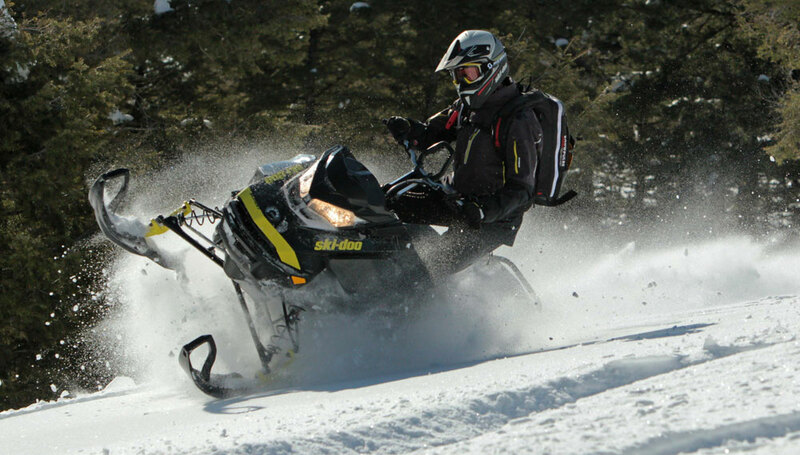 Driving the new PowderMax Light track is Ski-Doo’s new pDrive primary clutch that sends its rotational forces to Ski-Doo’s driven clutch, the faithful QRS. It spins the drive belt in tandem with the QRS clutch. The track drivers are six-tooth drivers with a diameter of 6.5 inches/166 mm. At the business end in the chaincase, the small sprocket teeth count in 19, the large sprocket having 45 teeth, this for both 154 and 165 track lengths. The PowderMax Light track is a 3.5-pitch track with wide-spaced paddles to shovel snow in vast amounts. The 3.5-inch (9 cm) pitch track is 10 pounds lighter than the XM’s 3.0-pitch track and keeps snow between lugs for added performance. 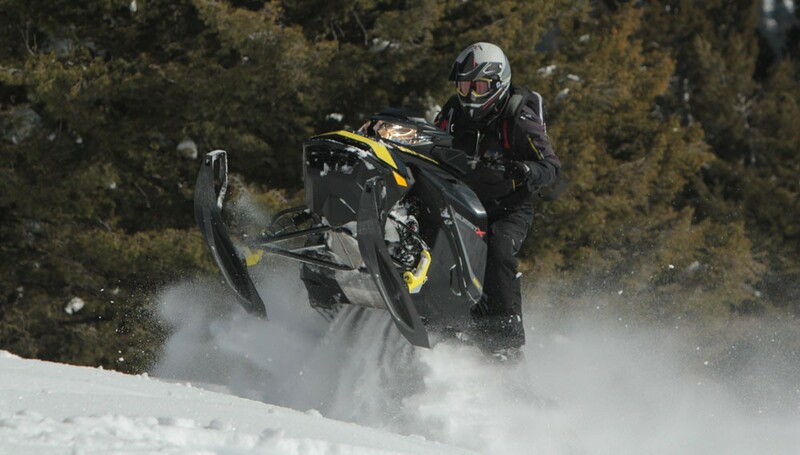 And true to Ski-Doo’s tradition, the track is 16 inches wide (41-cm), which makes it a powder floater. Available with the PowderMax FlexEdge 2.5-inch track or the three-inch PowderMax Light track, the GEN-4 REV Summit X with these 16-inch wide paddle tracks will climb the iceberg that sunk the Titanic. The extruded grid-style runningboards are narrower than last’s year’s XM X Summit, as well as the lower side panels being cinched in two inches. The foot wells are forward 2.6 inches from last year and are more open and spacious. 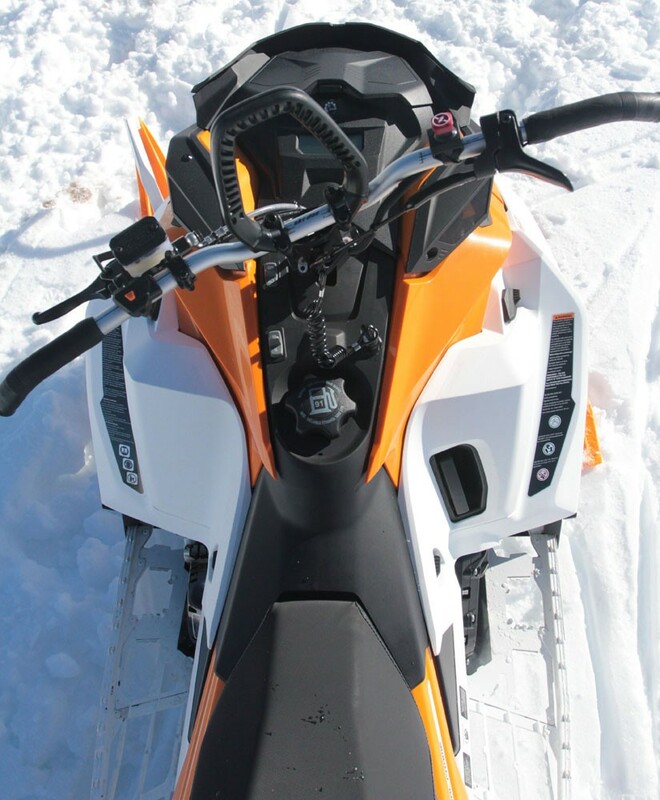 The runningboards have a flatter angle, more than the XM and the other OEM’s mountain snowmobiles, which reduces rider fatigue at the knees, ankles and thighs. The foot boards are 0.75 inches higher from ground level than the XM Summit. 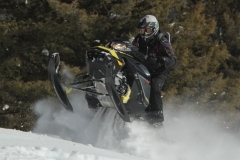 Ski-Doo claims its Gen-4 REV Summit X Rotax 850 twin cylinder two-stroke builds 165 horsepower; 10 more than the 800R E-TEC. The 850 has 106.6 lb-ft of torque, 19% more than the 800R E-TEC. Achieving this peak horsepower and torque comes when 7900 RPM hits the clock. A new heat exchanger system keeps the narrow motor cool and too, prevents snow thaw from occurring at the tunnel’s end thus creating an ice castle on the runningboards. This prevents the vehicle from gaining weight. In the certain snow conditions, the previous XM Summit X was known for gaining weight as the day progressed. The Summit X 850 has open runningboards like none other. The extruded grid-style runningboards are narrower than last’s years XM X Summit, are higher from the ground surface than the ’16 XM X, and provide a means for snow to drop through. The motor is 1.6 inches/40mm narrower than the 800R E-TEC, has a two-pound lighter two-piece forged crankshaft, which means the motor spends 15% less inertia (energy) spinning the crank. The motor has a unique oiling system, in that oil is sent directly to the main bearing and crank bearings. This means less oil consumption. The 850 E-TEC engine’s cylinders are plasma coated, tech pulled from long-lasting automotive and diesel engines. The 850’s displacement is an actual 849 cc from an 82mm bore and an 80.4mm stroke. The 850R has a smart RAVE system called eRAVE that is three times faster and more intelligent than the 800R’s RAVE system. The electronically controlled exhaust valves system tells the motor to hold fat torque loads at low RPM, while on the opposite end, at 7900 RPM, eRAVE allows the motor to be open and to breathe. With its grunt-filled 850 twin, boosted fuel-injection, pDrive primary clutch, and deep-lug sneaker at the back end, the Summit X like to launch, while remaining stable. But be fast, as this sled reacts to driver input with zero hesitation. The primary clutch – pDrive – has clicker adjustments, friction free dual rollers that transfer engine torque rather than relying on traditional sliding buttons. The oversize rollers with needle bearings, wide flyweights and a shaft-on-shaft design reduces friction, reduces inertia and being lighter, than the 800R E-TEC’s drive clutch, requires less motor-effort to spin; overall, the pDrive is 3.7-pounds lighter than the clutch on the 800R Summit. With adjustments to the rollers, drivers can easily configure the drive clutch for altitude and snow conditions. Engagement and belt squeeze are moments away to a perfect set. Think of it like adjusting pressure on a set of clicker shocks; it’s that easy. 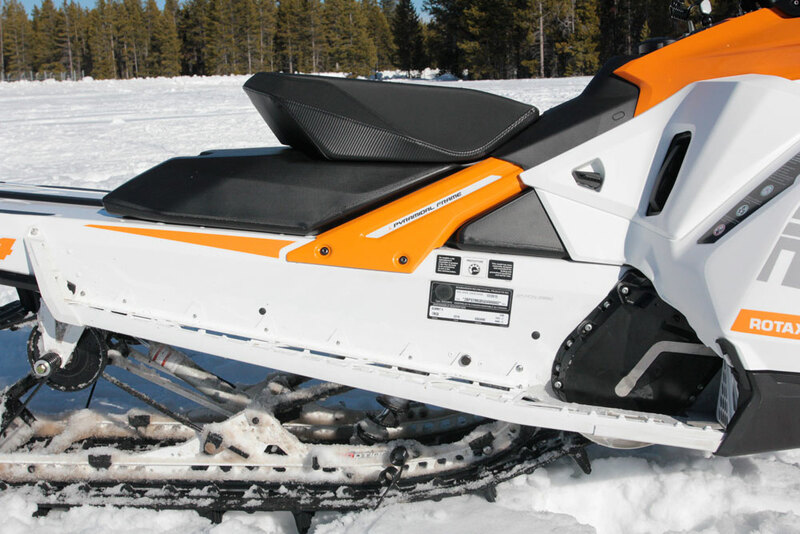 This tailor-made 850 Summit X has what Ski-Doo labels, “Powerdynamic,” where the body side panels, as well as the REV Summit’s new hugely-open and narrow runningboards and open tunnel cap give the REV Summit its deep snow maneuvering and sidehilling capabilities. The narrow body, beveled tunnel, tank, seat and handlebar controls are compact for the driver to have the real estate to move about. 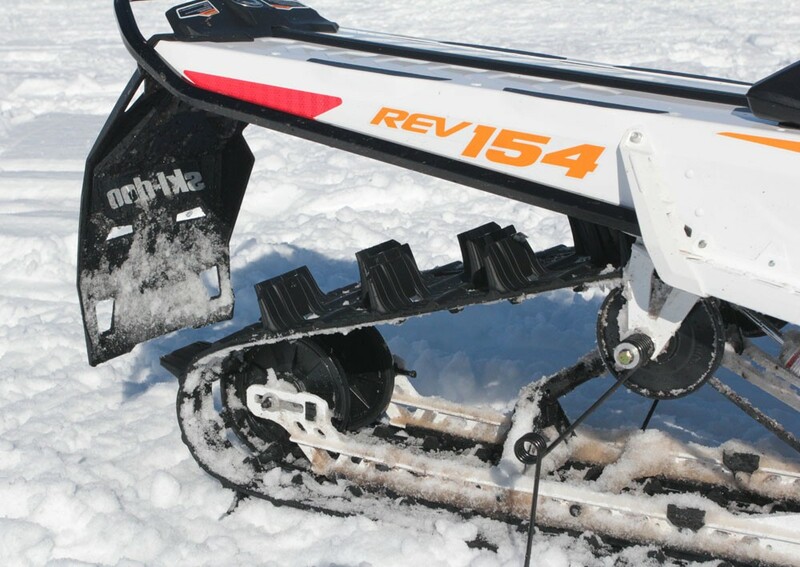 Ski-Doo cinched in the REV Summit by four inches, two inches on each side, and moved the front toe hold forward, rather opened it more toward the engine, by 2.6 inches. The lower side panels were elevated up one-half of an inch to minimize the pan’s surface from dragging the snow. 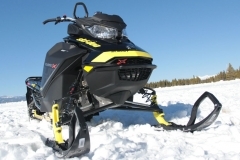 The Summit X also has what Ski-Doo calls, “Powerpack,” which defines its narrow chassis with its greatest mass – the 850 motor – to be fully central to the chassis’ front end. This centralization is where side-to-side weight distribution is 50/50. Components that were once on the right or left were transferred to the opposite side to assure the Summit X 850 was equally weighted over each ski. 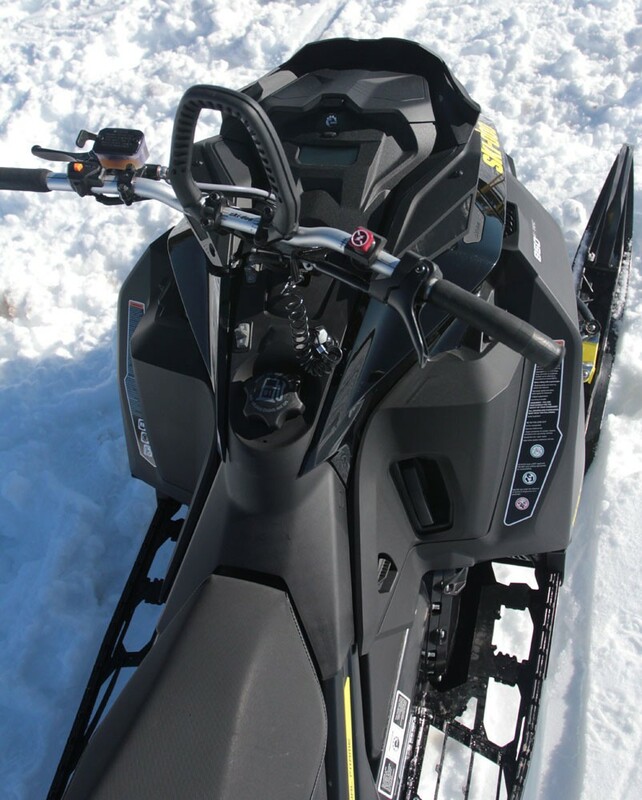 We visited with Bret Rasmussen, Ski-Doo ambassador and backcountry technician who owns and operates Ride Rasmussen Style (www.riderasmussenstyle.com), and he told us the steering on the Gen-4 Summit X is a “standard pitman arm style,” which has fewer parts than a rack-style system. This too contributes to some of the X’s weight loss. Rasmussen also told us the RAS-3 front suspension includes a spindle design that, with the DS 3 ski, prevents the ski from over pivoting. Meaning, there is a mechanical stop that makes contact after the rubber ski stop is compressed. Overall, the ski will not stand straight up when coming out of a tree well when the motor is full-on in boost-happy mode. 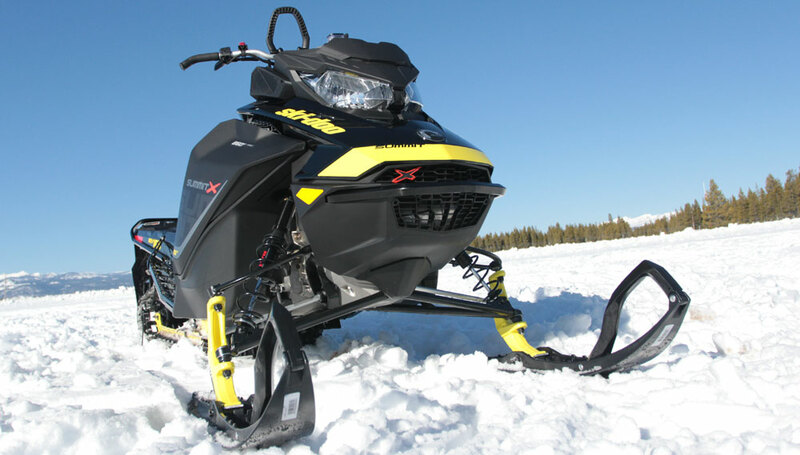 Ski-Doo retained the Pyramidal design for the Gen-4 Summit X, but it is not the same as its predecessors, the XP and XM, it is all new. With this GEN-4 design, comes lifted and flatter runningboards. The steering post is a laydown post, or horizontal post, and is slightly pushed forward compared to the XM’s. Steering post block is 7.5 inches tall. The GEN-4 REV Summit X is 25 pounds lighter than a comparable Summit X 154 or 163 from yesteryear. The weight loss comes to the mountain rider as a complement from the lighter RAS-3 front suspension, new PowderMax Light track, and ceramic coated exhaust/muffler, to name a few. 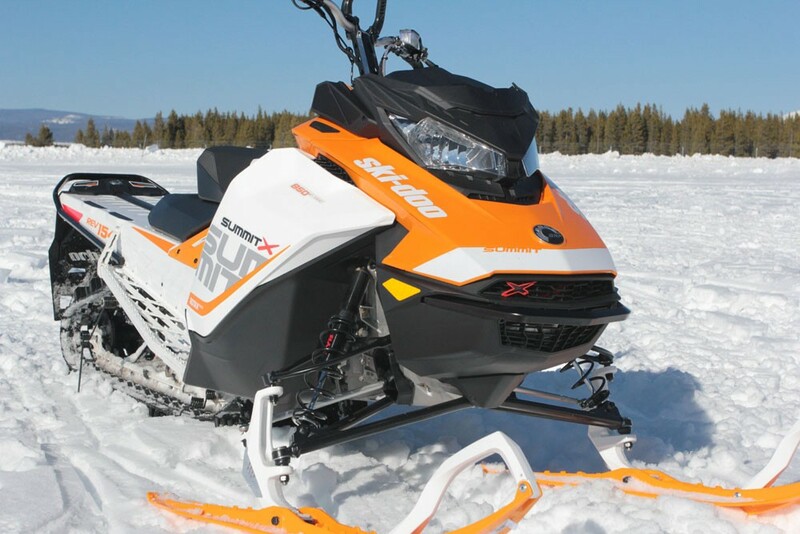 For accessory hounds, the Summit X can be loaded up with a plug-and-play electric start, rear tunnel storage and fuel storage via Ski-Doo’s LINQ system. A more spacious goggle box is available, as well as adjustable toe holds (pegs) for the foot wells and color-coordinated pre-drilled skid plate. 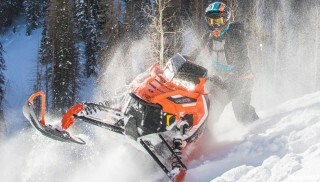 Ski-Doo has made the 850 Summit X a delight for deep backcountry riding. Setting a counter-steer stance to roll the Summit X 850 into a mountainside is effortless, easy and simple. Ski-Doo claims this Summit is agile. Yes, that is a true statement. But, are you quick enough to keep up with its lively and powerful attitude? 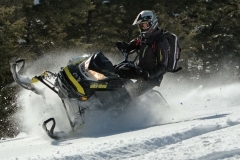 Ski-Doo did challenge itself, and in our estimation, it exceeded its own expectations. From five days on the 850 Summit X, regardless of track length, the Summit X is the best Summit product to date. Its ability to respond bends the mind. The need to only, and we mean only, ride it most of the time straddling the seat has fully come. Oh, there are times when aggressive wrong-foot forward riding is needed, but when this need arises, be wise and judicious on runningboard and handlebar pressure, as it will roll over. Meaning, back off, don’t make riding the 850 Summit X hard work. The 850 Summit X is a hardworking powder player, but it makes your work a breeze. The 165 Summit X is a bit more planted than the 154, but rolls right and left with the same ease as its shorter sibling. When it comes to casing a sidehill, the 154 sets in easier and quicker, but the 165 is a nanosecond behind. 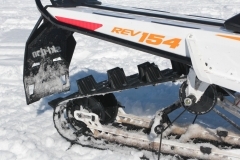 Meaning, the quick REV Summit X is easy, agile, effortless and a snowmobile that wants to please; the 154 and 165 want to do the work so you don’t have too. The chassis proves to be clean of snow- and ice-buildup. Nice. The seat and handlebars are perfectly positioned. We also praise the runningboards’ width and fairly flat angle. What we wish for is the optional adjustable riser handlebar post and injection-molded knee pads to come as standard equipment. But, we understand, dealers need options too – to sell added merchandise. 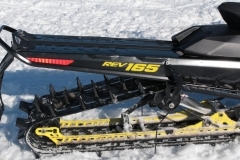 This fourth generation Ski-Doo 850 REV Summit X is agile, sweet, effortless and powerful.